Shortly after my daughter was born, two years ago, I was asked by the Star Tribune to write about the experience of being a first-time father. A weekly chronicle of transformation, discovery, and one-sided battles with the diaper genie. Pepin, almost as soon as she left the hospital, became part of my work. It wasn’t supposed to be this way. Writers, artists, circus performers—we don’t set out to make muses of our children. But there they are, as unshakeable as skin. To write, draw, paint, or dance about them is to listen to your own breath. 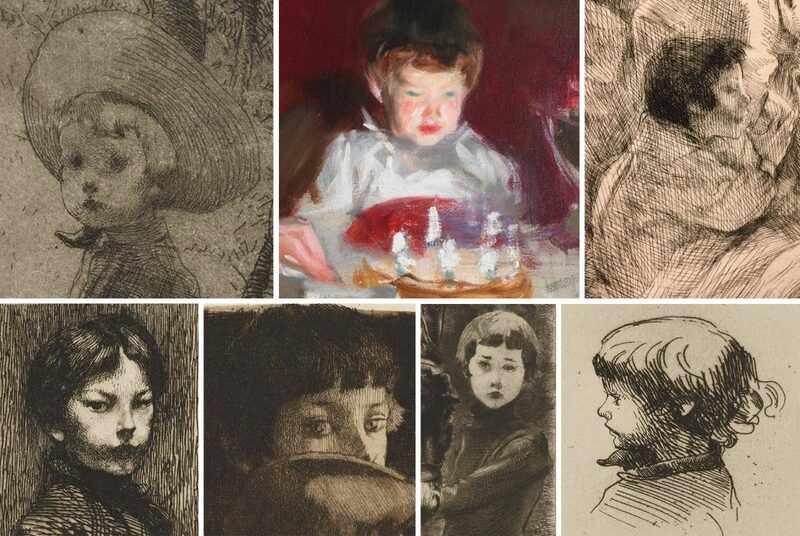 Robert Besnard, growing up in the drawings of his father (and, in color, John Singer Sargent’s painting). Mia has a trove of prints by Albert Besnard, a Parisian painter, muralist, and printmaker in the late 1800s and early 1900s, and curator Rachel McGarry recently noticed how many of these prints feature his family, especially his oldest son. Robert was already something of a child celebrity in Mia’s galleries—he’s featured in John Singer Sargent’s beloved painting of the “birthday boy” (Sargent was a friend of the family), marveling at the candles on his cake. And now McGarry has created an exhibition around him, using six of his father’s drawings to suggest a childhood in progress, from toddler to 9-year-old. Besnard, it seems safe to say, was not a helicopter dad. In Sargent’s painting he is standing to the rear, almost featureless, like a shadow. His etchings of Robert are charming but unprejudiced, aching with vulnerability and stolen moments, as though we are looking at the boy through a window. They bear no relation to the maniacally smiling snapshots that fill our phones and social media. Artist dads, like all dads, observe our children because we are responsible for them and because they are mysterious to us. But what artist dads make of our observations is how our children may eventually come to know themselves. And it is how they may come to know us: men who are most comfortable in the world when we have captured it, the better to understand and appreciate it, to say I know you. Top image: Detail of John Singer Sargent’s The Birthday Party, from 1883, on view at Mia in gallery G351.